The Savannah Cat is a elegant and whimsical feline, that is a blend of wild and tame, exotic and domestic, cat and serval. They are pets however and not wild animals. Wyldthingz is located in Northern California in the North Bay Area, 1 hour from San Francisco and 2 hours from Sacramento, near Healdsburg. Our kittens are loved like family, handled daily, and exposed to other breeds of cats, dogs, and two legged critters called children. The kittens are not kept in cages. This is our home as well so visiting in only for serious buyers. Since 2004, Wyldthingz has been creating lovely cats, now in breeding programs all over the world, gold, black, smokes, and silver, often with the coveted black-serval nose, show quality with pet personalities. F2 through F7. 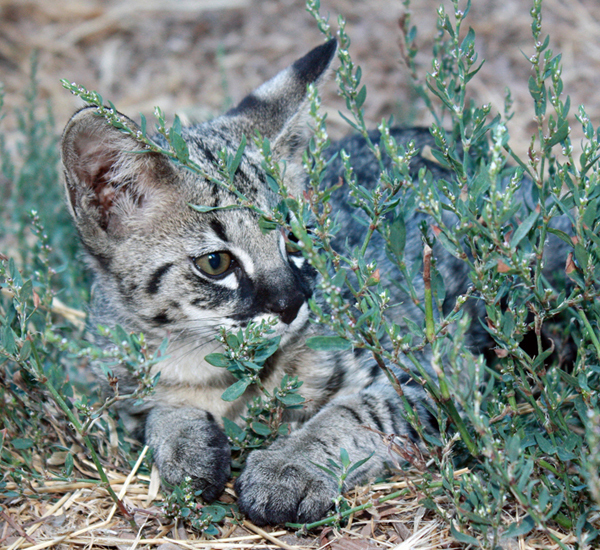 There is nothing like a Savannah cat- beware- you will get hooked! Please check the kitten link for current kittens available. I update photos often, all available kittens are posted. The Savannah cat was developed using crosses with Bengal, Oriental shorthair, Egyptian Mau, and spotted Domestic shorthair cat with the African serval. The goal is to retain the lovely qualites of the serval, but in a smaller package. Savannah cats are not necessarly a HUGE cat. Some of my savannahs are large, however I make no promises for size. Savannahs are intelligent, adventurous, play fetch, like water, and definately eye catching. In 2004, I fell in love with both the Savannah’s looks and confident nature. I found a cat that was a social as a dog and wouldn’t be daunted by our active home. They are only wild "looking" but very much house pets and should be kept indoors. We breed F2 through F7sbt.